Ananth Jillepalli is a doctoral student at the University of Idaho. He received his master's computer science (cybersecurity) degree from U of I in 2017 and his bachelor's in computer science and engineering degree from Jawaharlal Nehru Technological University in 2015. 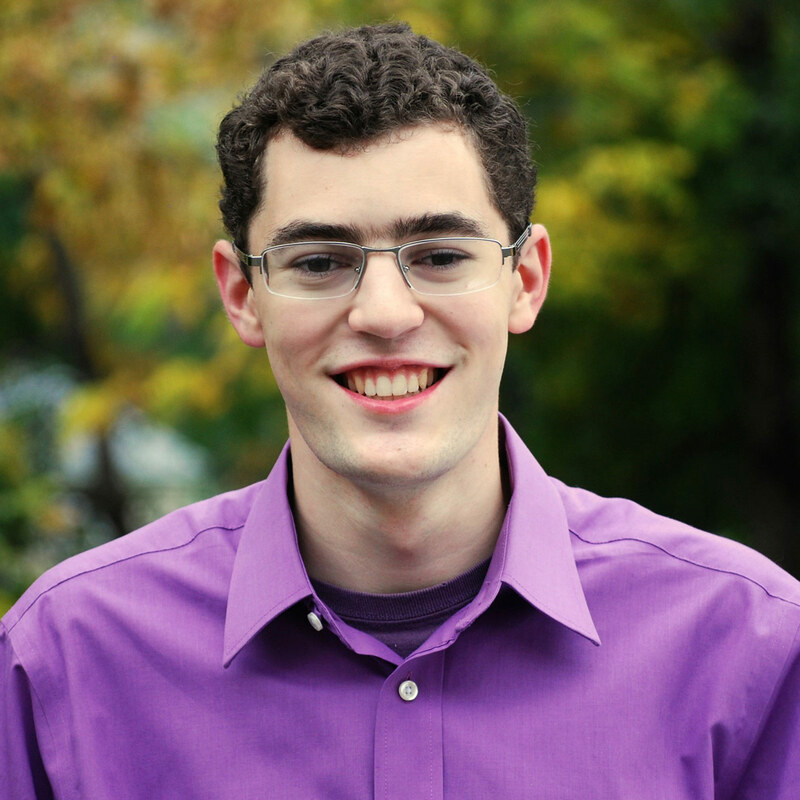 He plans on a career in academia and is grateful to have found brilliant mentors at the Department of Computer Science, especially Professor Daniel Conte de Leon — his advisor. He believes that advances in science and technology are mankind’s way to the future. 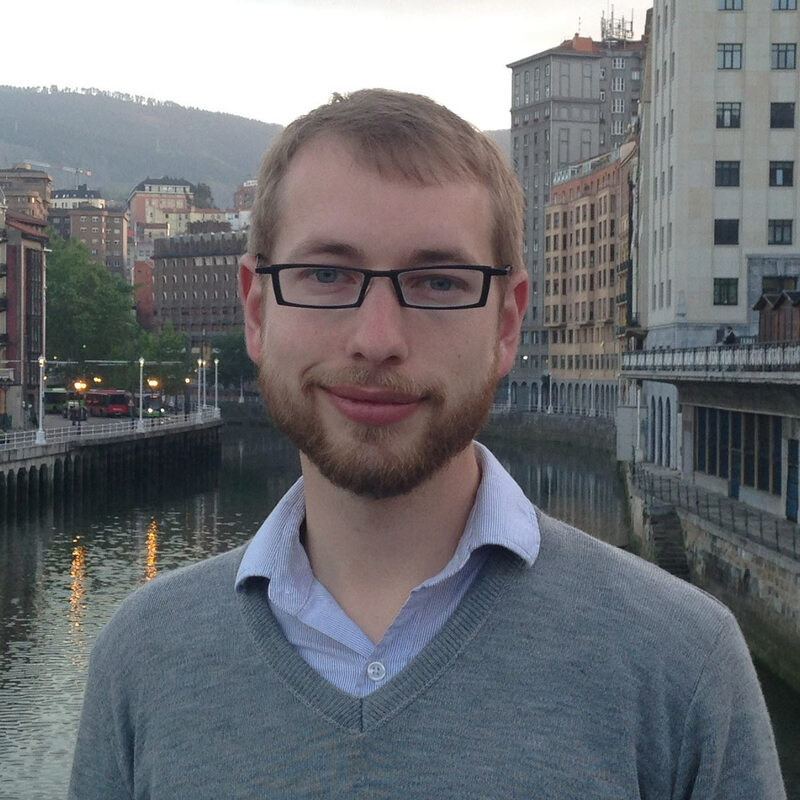 His current research interests include design and analysis of critical infrastructure risk assessment methodologies using adversarial modeling. He also believes in community service and is an actively serving member of the Graduate and Professional Students Association and the U of I International Programs Office. Growing up in Boise, L. Damon Woods has long cultivated a passion for the natural beauty of Idaho’s landscapes. The trout streams of the Rockies guided him to Montana State University in Bozeman. After trying out a few majors, involvement in the MSU chapter of Engineers Without Borders opened his eyes to the practical ways engineering could improve people’s lives. This led him to a bachelor's in mechanical engineering with minors in aerospace and English literature. 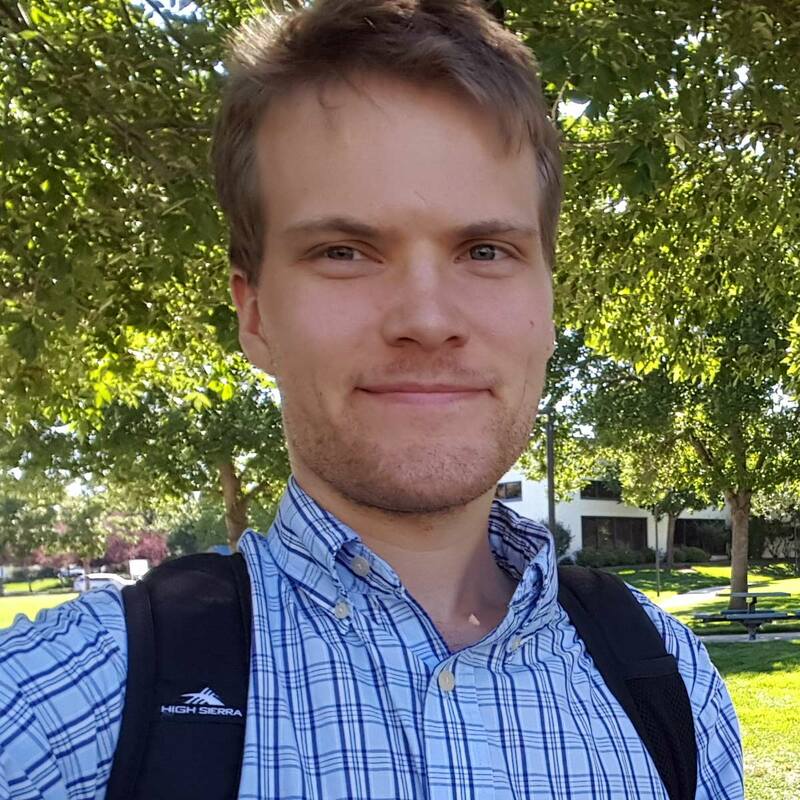 Woods came back to Boise to pursue a master's at Boise State University where he studied wind and hydrokinetic turbines, culminating in a six month internship at Alstom Power in Switzerland. 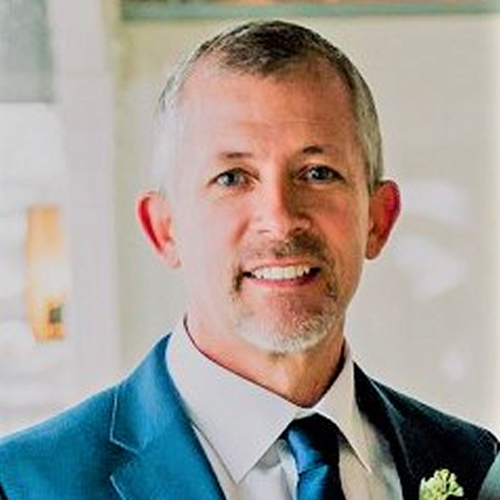 Returning home, he started his doctorate at the University of Idaho and began work as a research assistant with the U of I Integrated Design Lab (IDL). The IDL facilitates collaboration between engineers and architects to promote efficient and healthy buildings. The work is at the intersection of his passions of environmental and fiscal sustainability. After graduation, Woods plans to continue at IDL where he researches technologies that benefit building owners and occupants. None of this would be possible without the tremendous support of family, friends and the faculty at U of I.
Coleton Bailey was born in Michigan, but was raised in Hailey, Idaho. With the outdoors in his backyard, Bailey and his brother spent plenty of time riding bikes, skateboards and motorcycles. A natural curiosity meant that he had put a wrench on all three at one time or another. As he got older Bailey spent more time in his stepfather’s body shop, working on cars and engines alike. These experiences and understanding of mechanical systems sparked his interest in studying mechanical engineering. As he moved through the program at the University of Idaho, he felt like he found his calling. The math, problem solving and challenge of the field are all things Bailey enjoys. When he graduated with his undergraduate degree, he didn’t feel like his time at U of I was complete. There was so much more that he wanted to learn from the people here, so he stayed for his master's degree. Now that he is finishing his second degree he is not only confident in his ability and skills, but he also has an appreciation for everything that he still must learn. He will always value his time at U of I and will always be a proud Vandal. 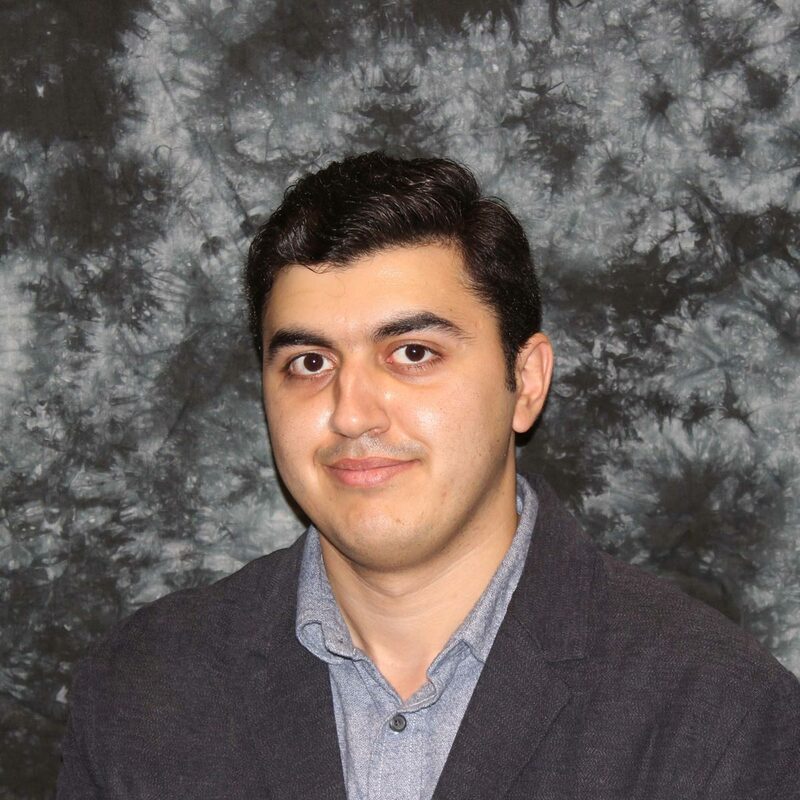 Mustafa Ammous, originally from Jordan, attended King Fahd University of Petroleum and Minerals for his bachelor’s degree in electrical engineering before joining the University of Idaho in spring 2017 for his master's degree. Mustafa is graduating in summer 2018. He is working in the area of intelligent transportation systems for his thesis work. Mustafa seeks to develop new algorithms for the autonomous mobility-on-demand systems which is expected to dominate the future of transportation in smart cities. Mustafa will be joining the University of Toronto in fall 2018 for his doctorate also in electrical engineering. After graduation, he plans to be a faculty member. LeeAnn Hold was born and raised in El Dorado Hills, Calif. She is currently pursuing a bachelor's in biological engineering with minors in pre-health and mechanical engineering. Hold joined the United States Navy immediately after high school where she worked as an electronics technician. She was deployed to the Coast of Somalia for nine months on DDG 95 the USS James E. Williams for pirate control. After a three-year tour, Hold, her fiancé, Stephen, and their pug drove across the country from Norfolk to begin school at the University of Idaho to pursue degrees in engineering. In January 2018, Hold began conducting research on using stem cells for tendon tissue engineering in Professor Nathan Schiele’s laboratory in the Department of Biological Engineering. As a Beckman Scholar, Hold will continue her research in Professor Schiele’s laboratory over the next two years. Her project aims to understand the mechanical and biochemical factors that control stem cell behavior for directing engineered tendon tissue formation. Alexanderia Rockwell grew up in Grangeville, Idaho with two older brothers and two little sisters. 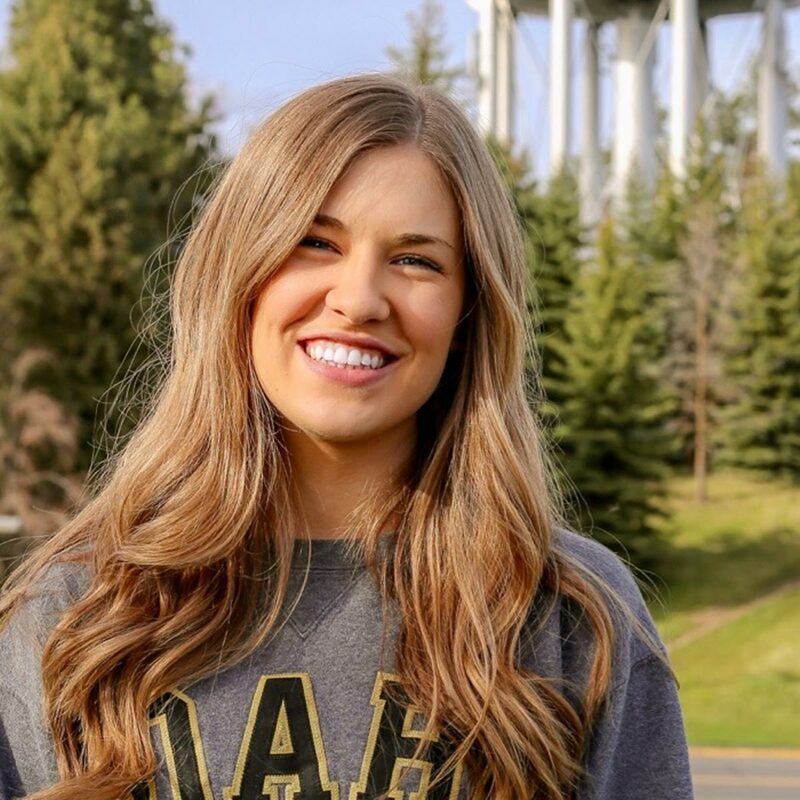 She loves the outdoors and the simplicity of a small town, so deciding to attend the University of Idaho was an easy choice. Following in her grandfather’s footsteps, she began her college journey as a pre-medical student studying microbiology, but quickly found herself wanting to apply her mathematical strengths, as well as those in science, through a biological engineering degree. While at U of I, Rockwell has been a member of Delta Gamma Sorority, the Honors Society and the Biomedical Engineering Society. She has gained tremendous amounts of support from family, friends, fellow students and the amazing faculty throughout the last four years, which she will always be extremely thankful for. After graduation, Rockwell will work for Stryker as a supplier quality engineer, where she is excited to broaden her knowledge and love for the medical field and the future of medical devices. Originally from Missoula, Mont., Aaron Hope decided to attend the University of Idaho in pursuit of a degree in chemical engineering in 2014. Among other things, the university’s undergraduate research opportunities, generous scholarships and the Lionel Hampton Jazz Festival made the U of I stand out as an excellent choice for education. While initially missing the mountains of home he soon came to appreciate all that Moscow had to offer, participating in the Vandal Marching Band and the Engineering Scholars program during his freshman year. Over the rest of his education, Hope had the opportunity to work one on one with faculty on research projects, presenting work at the Undergraduate Research Symposium, as well as to intern with Micron Technology’s technology development sector, where he will return to start a career this summer. As Hope prepares to move into the next stage in pursuing his career, he is grateful to the family, friends, faculty and peers that have supported him over the last four years. Alex Nuttman joined the Vandal family after graduating from Grangeville High School in 2014. She has been very active in Society of Women Engineers (SWE) and American Society of Civil Engineers (ASCE), serving as president of both groups. 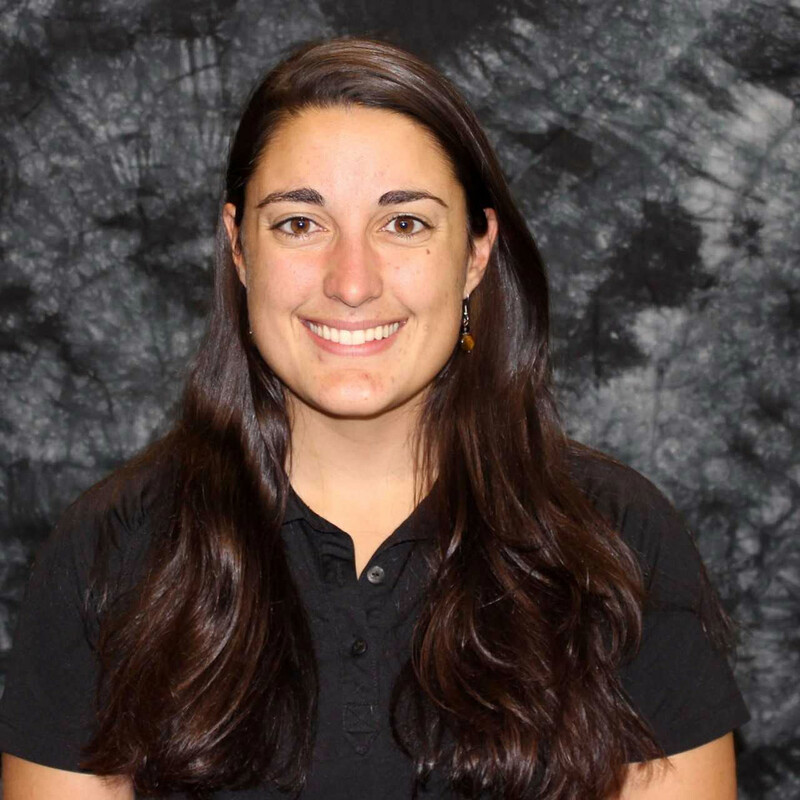 She has been a member of the University of Idaho's Concrete Canoe Team all of her four years on campus and works representing the U of I as a campus tour guide. Nuttman has held internships with Kiewit for the past two summers and will begin full-time employment with Kiewit in Hawaii after graduation. Coming from the quiet island town of Wrangell, Alaska, Matthew Covalt moved to Moscow to attend the University of Idaho in fall 2014. With little opportunity to explore engineering during his grade school experience, he was first introduced to the field at U of I. Uncertain about what area he wanted to focus in, he chose computer engineering as he though it encompassed an interesting and useful set of disciplines. Quickly adapting to this new learning environment he showed high aptitude for his rigorous engineering classes. 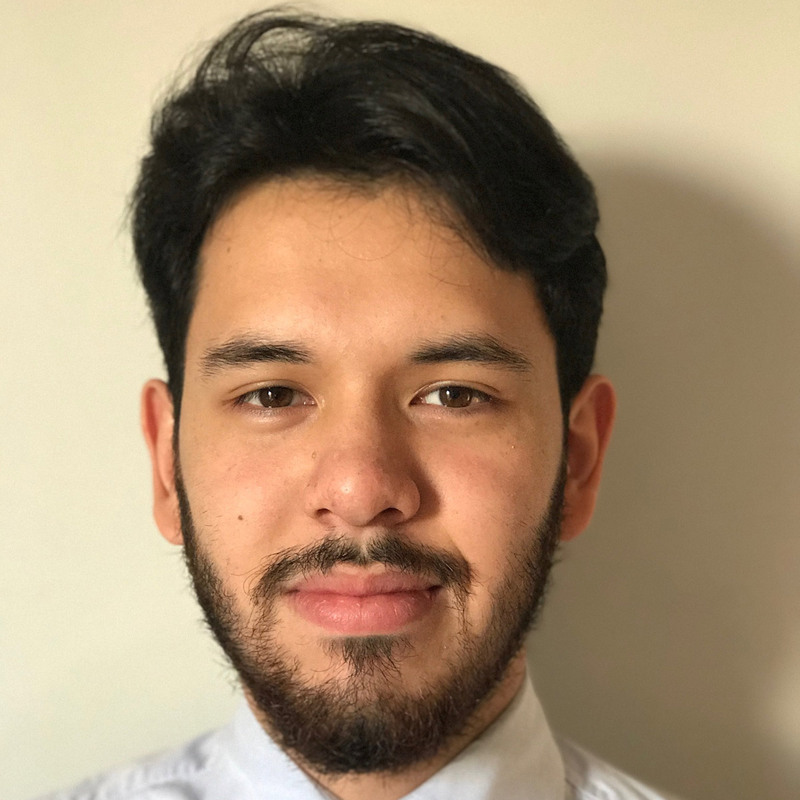 Through this success he was offered many opportunities outside of his courses, such as traveling to San Francisco to attend an engineering conference and being a teaching assistant for a microcontroller lab. Through this network he built at U of I, he was offered an SSD Firmware Engineering Internship at Micron’s Boise campus. After thoroughly enjoying this experience and adapting well to the new industry environment, he was offered a full-time position there and will move to Boise after graduation to pursue his career. Though he greatly values his professional network, the personal network of fellow students that he has made is of the greatest importance. Having the opportunity to work among brilliant peers on a senior project and numerous engineering assignments is his most valuable takeaway from his time at U of I.
Adrian Beehner was born in Spokane, Wash., and grew up in the rural town of Kellogg, Idaho. At an early age he was fascinated with technology, particularly video games. Wanting to stay close to family, Adrian began college at North Idaho College, starting out originally as a biology major. After a year, he realized that his true interest lied in mathematics and technology and soon pursued computer science. After almost finishing up his associates degree, he was notified of the opportunity of University of Idaho expanded their Computer Science program to Coeur d’Alene, which he quickly jumped at. Being the first student and only senior of the Coeur d’Alene CS program has presented Adrian with many unique opportunities and challenges. 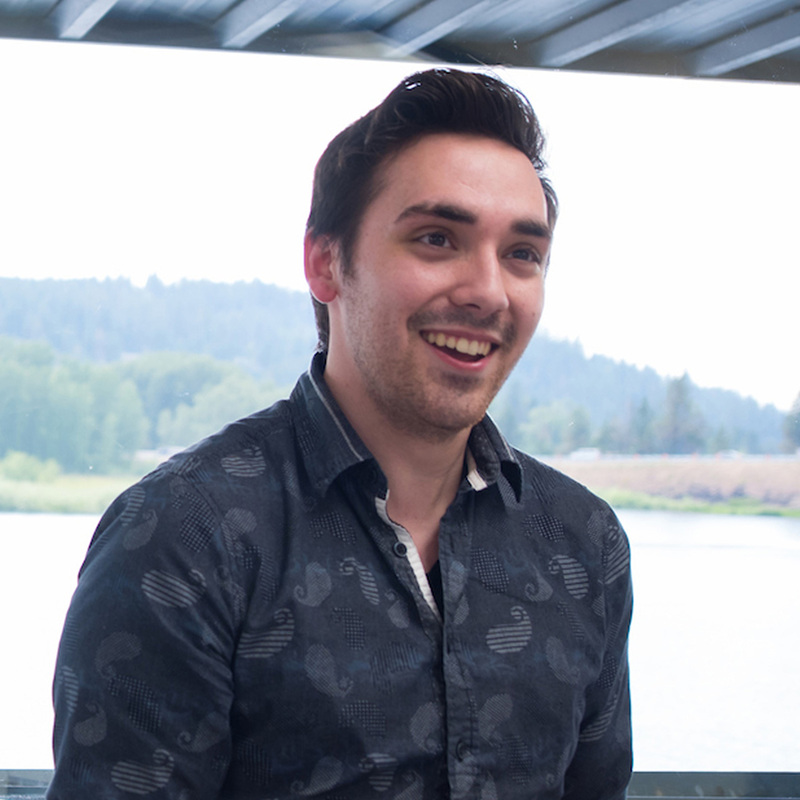 He has experienced remote software (and hardware) projects with students from the Moscow campus, interned at U of I over the past summer, helped with Dig'nIT's summer camps and participated in “The Great Robot Debate” (U of I Coeur d'Alene). Specifically, he recently has been turning his attention to robotics and vision recognition, such as working with Baxter, an industrial robot built by Rethink Robotics and now beginning work on autonomous navigation of a submarine built by Gizmo (Gizmo Drone). 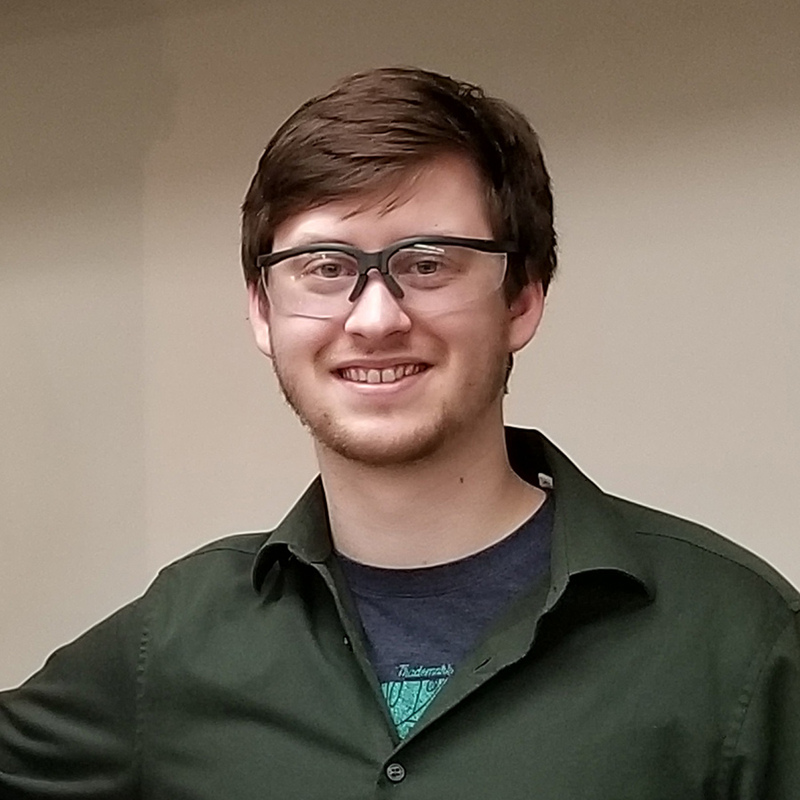 After graduation, he plans to pursue graduate studies at U of I and this summer continue his work on autonomous navigation for the Gizmo’s submarine. Adrian is grateful to all the support, encouragement, opportunities and knowledge that U of I and North Idaho College have provided and to the faculty and staff that have helped him. Zachary Spence is graduating with honors this May 2018 with a bachelor's degree in computer science and a minor in history. He served as a CS tutor and CS laboratory assistant for two years. He was also a mentor for three Dig'nIT summer coding camps for high school students. These mentoring activities very much inspired him to pursue a master's in education and to embark in a career as a science and computing high school teacher. Spence earned the 2017 Alumni Award for Excellence and has been on the College of Engineering’s Dean’s List since joining University of Idaho. During his time at U of I, he has participated in and contributed to many extracurricular, leadership and service activities. He was elected three times (yearly) senator of the Associated Students of U of I (ASUI). As a senator he served in leadership positions such as chair of the Committee on Rules and Regulations and vice-chair of the Ways and Means Committee. He regularly contributes to the Pi Theta Chapter of the Phi Alpha Theta History Honor Society, indulging his passion for history. As part of his love for the sport of fencing, he is currently the president of the U of I Fencing Club. He enjoys coding, teaching, reading, writing, fencing, singing, serving and helping others, and spending quality time with family and friends. Born and raised in the capital of Brazil, Rafael Akio Alves Watanabe never thought he would be graduating from the University of Idaho. From a young age, Watanabe displayed an interest for mathematics and physics but had not considered engineering before coming to U of I. During the last four years, Watanabe has managed to complete his electrical engineering and mathematics majors, incorporate some graduate courses in his academic schedule and maintain a continuous membership to the Honors Program. Because of his interest in electronics, Watanabe has assisted with the ECE 310 class, has attended the International Solid State Circuit Conference (ISSCC) and has worked on a Fast Acting Hardware Trojan circuit for his senior project. After getting married this coming summer, Watanabe will start his master's degree in electrical engineering at U of I in the fall. Dee Rasmussen was born and raised in the Idaho Falls area where he graduated from Bonneville High School. After graduation, he attended Idaho State University where he studied business. In 1992 Rasmussen decided to get married and slowly dropped out of school. He and his very supportive wife Heather soon started a family and today have three children Alexandria, Drake and Abigail. Rasmussen started working full-time as a powder man performing controlled blasting in Eastern Idaho. He enjoyed the work and was proud of the different blasts he had accomplished, but it was very labor intensive, and his back was suffering from the physical demands of the job. In 2007, Rasmussen had an opportunity to take some training through a partnership of Eastern Idaho Technical College and CH2M-Hill and was trained as a radiological control technician (RTC). He started working as an RTC in 2007 and completed the job training. A couple years later, he took advantage of the Idaho National Laboratory Education program and enrolled in the Industrial Technology program offered at University of Idaho, Idaho Falls. He knew he would be more successful in his new career with a science background and the bachelor’s in industrial technology checked off all of the boxes, plus he had always regretted not finishing college. In 2012, Rasmussen successfully passed the National Registry of Radiation Protection Technologists (NRRPT) exam. He attributes his success to the courses that are required in the Industrial Technology program especially the physics, chemistry, math, nuclear rules and regulations and many other classes. The program also allowed Rasmussen to take classes at night, on Fridays or online, so he could continue to work full-time. Brandon Hilliard was born and raised in Boise, Idaho, working on cars and excelling in school. Ever since he can remember, he always was been interested in mechanical things — how parts worked together, what went in to a part design, and why certain materials were used in specific applications. Hilliard spent a lot of his childhood watching his father work on his own cars in their garage. While doing so, his interest for mechanical things grew. In high school, he enrolled in automotive technology training for his sophomore, junior and senior years. After graduating high school, he decided that he wanted to design and create the parts he had been working on for those three years. 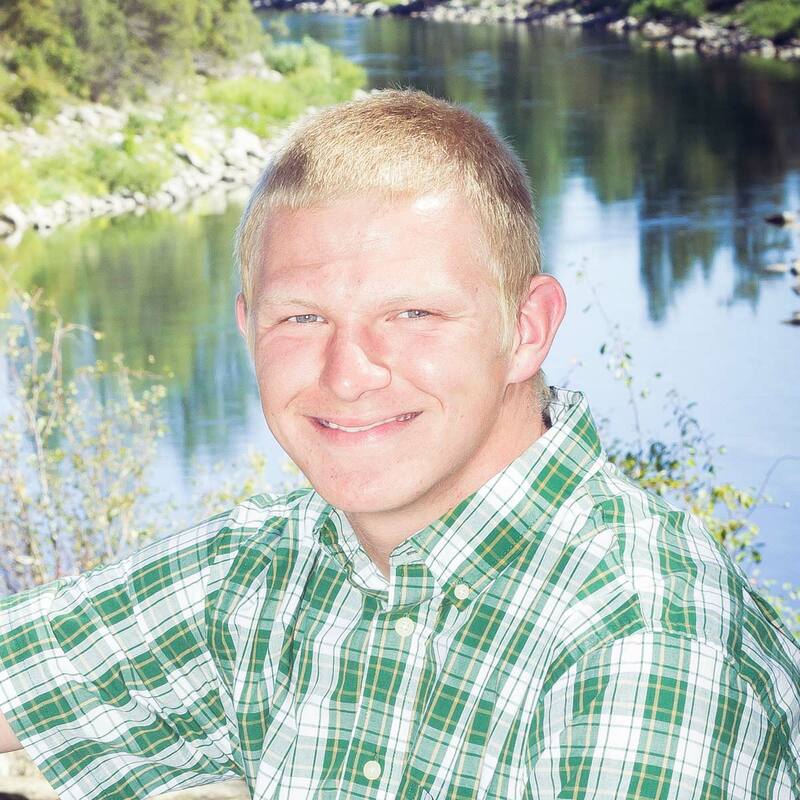 At the time, his sister was enrolled at the University of Idaho, and he had heard great things about the College of Engineering, so he chose to enroll in the Mechanical Engineering program in fall 2014. Ever since then, the Mechanical Engineering Department has helped Hilliard excel throughout his college career, from creative and in-depth coursework to endless opportunities for involvement. As he progressed through the program, he became much more interested in fluid mechanics, while still learning about the many design aspects of mechanical engineering. After graduation Hilliard will be returning to the U of I to pursue a master's in mechanical engineering with an emphasis in fluid dynamics studying with Professor Ralph Budwig. Kierra Ryan was raised in Clarkston, Wash. Throughout school she gained a love for math and science that lead her to engineering when she came to college. Growing up she always wanted to know how things worked and would take them apart to figure it out. She chose to go in to mechanical engineering because she enjoyed the hands-on aspect. 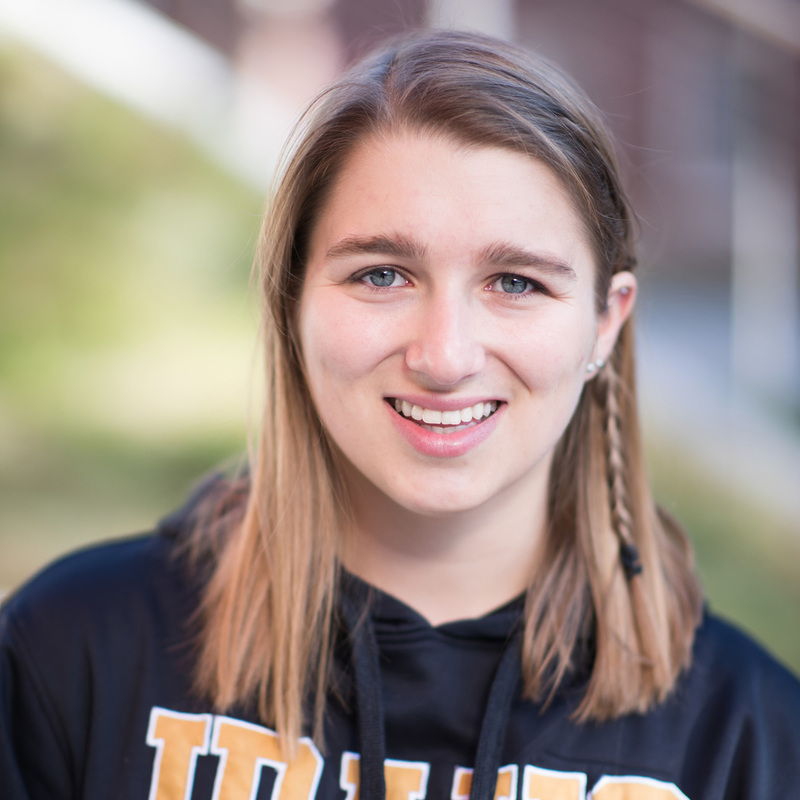 Ryan chose the University of Idaho not only for its well-known engineering program but also because she was excited to be a part of the Honors Program and loved the small classes offered within her major. She loved this area and all of the nature that is incredible close by. Ryan has enjoyed the opportunity to work on many projects as well as intern at Schweitzer Engineering Laboratories throughout her time in college. She believes the Mechanical Engineering Department does a fantastic job; they have found staff and faculty that genuinely care about their students. Ryan would like to thank her family, friends and the university faculty that have supported her throughout her college journey. 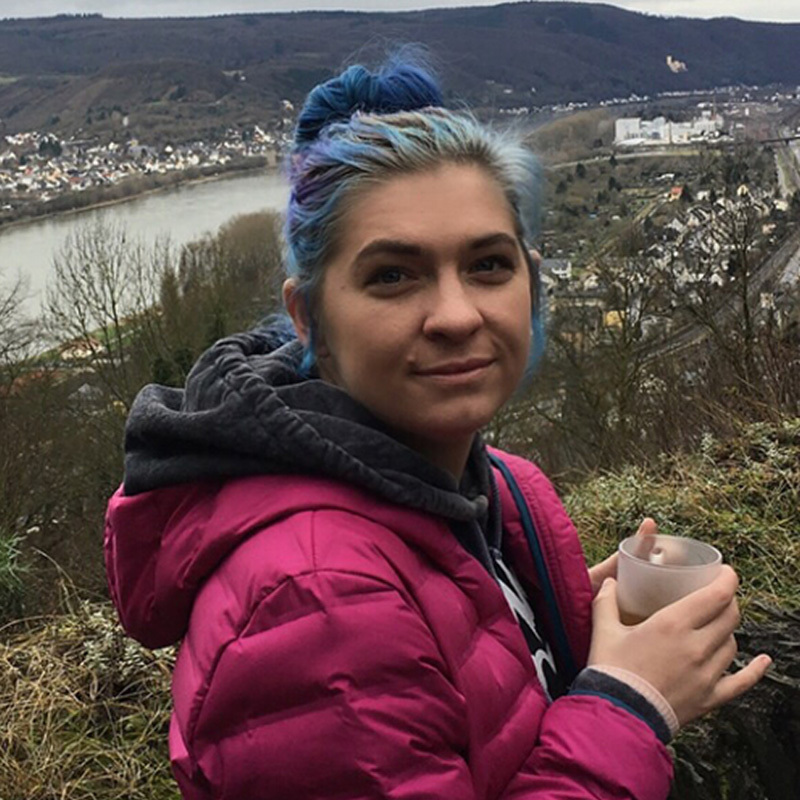 She will be graduating this spring with a bachelor's in mechanical engineering and is excited to be taking a position with NAVSEA after graduation. Born and raised in the Inland Northwest, Nicholas Shaber always had a passion for the outdoors. From an early age he worked in the shop with his father. Shaber enjoyed delving into projects and seeking to solve challenging problems. Throughout his college career, the most valuable skill has been the ability to solve problems; however, the desire to do his absolute best in everything that he does has been the most valuable. Shaber decided early on in his college career to focus on academics rather than splitting his focus between athletics and academics. As a result, he became an active member of the Engineering Scholars program, participating in many undergraduate projects. He have had the opportunity to learn to work with a team, especially in an interdisciplinary fashion. Through the projects and classes he has taken, he feels that he has developed a large variety of skills with much hands-on experience. 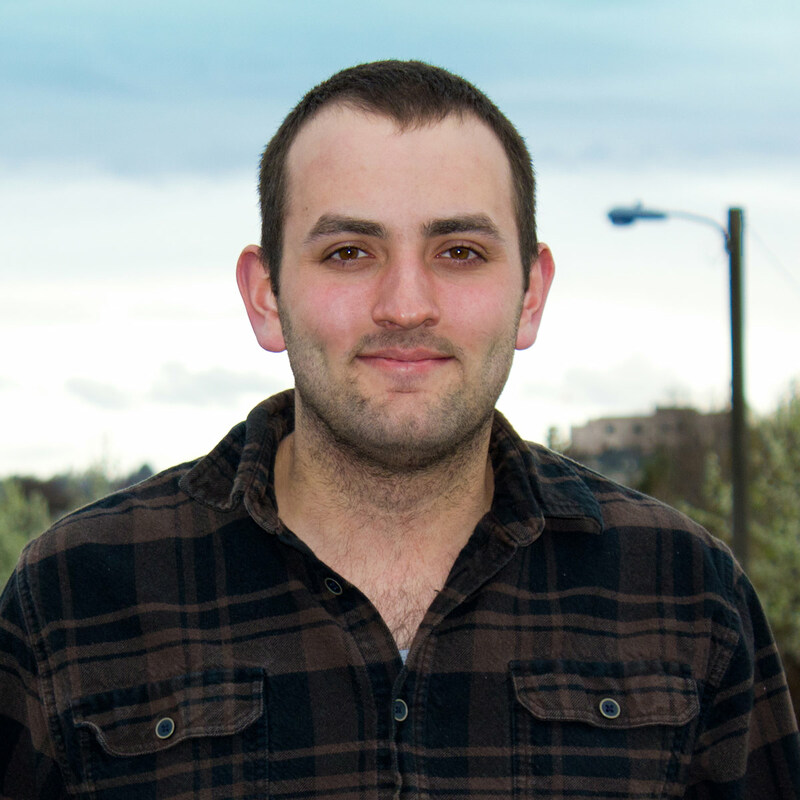 Shaber hopes to continue to develop his skills as an engineer as he works to complete a master's in mechanical engineering at the University of Idaho and then learning more as he moves into industry over next year. 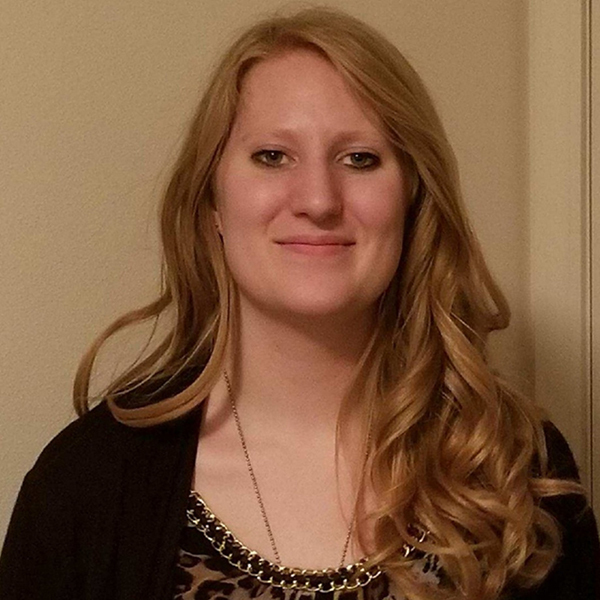 Margaret Fitzgerald graduated in December 2017 from the University of Idaho with her bachelor's in material science and engineering. Having grown up in Vermont, Fitzgerald had to learn to transition quickly to the drier climate and warmer summers that Idaho had to offer. She also enjoyed conducting undergraduate research, captaining the Ultimate Frisbee team, working as a College of Engineering Ambassador and exploring all the outdoor activities that Idaho provides. Fitzgerald was also able to intern for Micron Technology for two summers which allowed her to directly apply the classroom knowledge she gained in school and develop a passion for nanotechnology. In January 2018, Fitzgerald moved to Golden, Colo., where she is working on her doctorate in material science at Colorado School of Mines, while proudly displaying her Vandal heritage. The objective of the project is to develop a forklift sensor which displays the exact height of the forks to an operator. The interdisciplinary team has created a solution which measures the height of the forks, operates wirelessly while harvesting its own energy and transmitting data to the truck for display to the operator. Lumber mills produces hundreds of tons of waste woody biomass that has almost no economic value. Turning these bio waste to biochar is economically and environmentally beneficial. Our team’s mission is to develop and prototype a scalable model to retrofit existing boilers in lumber mills to turn wood waste into valuable biochar. Individuals recovering from post-stroke arm impairments can spend more time conducting therapeutic exercises at home than during supervised in-clinic sessions. To facilitate better qualitative and quantitative monitoring of therapy, the goal of the project is to develop a system that will track arm movements, including repetitions of prescribed exercises. Our goal is to create an easily distributable standard testing environment for gathering data and metrics to find the best possible acoustic navigation algorithm. This project monitors and characterizes the electromagnetic emissions of a microprocessor during boot to determine potential foreign modification in either software and/or hardware. The product consists of a system with an antenna, amplified in conjunction with a data acquisition platform to a Linux machine for processing by a custom algorithm. Biomass needs size reduction as pre-treatment before converting it to ethanol for fuel. The crumble head can get too hot if too much biomass is fed or the teeth are worn out. Our team is sponsored by ‘Forest Concepts LLC.’ To develop a non-contact temperature sensor to monitor temperature rise in those crumble heads. The team has developed an IR sensor array to profile the temperature along the scrubber head. A person's sensory perceptions judge coffee roast level is subjective, causing difficulties in comparisons and control of roasted products. Near-infrared (NIR) spectroscopy feedback of beans in the roasting process could reduce roasting variabilities. An improved roaster control method using onboard NIR monitoring for home roasters has been developed. The City of Caldwell has planned to improve the intersection of Ustick Road and Lake Avenue in Caldwell, Idaho. The project objective is to design a larger capacity intersection to meet increasing traffic volume while improving traffic operations, safety, and accessibility. Our mission is quantifying fuel economy impacts of different aerodynamic features on tractor trailers based on wind tunnel testing with scale models. An intricate process was designed and constructed to demonstrate an economical and environmentally friendly system that can reduce the sulfate concentration in mine-impacted water from around 1800 mg/L to less than 250 mg/L. Implementing this process in the mining industry would prevent sulfate from negatively affecting the environment. Only six percent of plastic ever produced has been recycled. A problem with polystyrene recycling is its low density makes it not economically feasible to transport to recycling centers. A small scale depolymerization reactor which could be distributed widely throughout municipalities to increase recycling of polystyrene was fabricated and tested. This project goal is to design a nearly undetectable hardware trojan capable of disabling targeted integrated circuits by breaking down the circuit at the transistor level and developing defensive schemes to prevent a widespread flash fatal trojan attack. Richard Christensen joined the University of Idaho faculty as the Nuclear Engineering director in 2015. He is currently also serving as the U of I associate director the Center for Advanced Energy Studies (CAES). He is a professor emeritus of nuclear engineering in the Department of Mechanical Engineering at Ohio State University Columbus, Ohio where he served on the faculty since 1978. Christensen is an internationally recognized scholar and leader in a wide range of nuclear and thermal sciences research areas. His research spans diverse areas such as nuclear thermal-hydraulics, nuclear waste isolation, advanced reactor concepts with a focus on inherently safe nuclear reactors, thermally activated heat pumps, waste heat recovery and a variety of fundamental convective and radiative heat transfer investigations. The unique aspect of his research is that it has invariably resulted not only in contributions to the archival literature but has also always resulted in practical implementations and commercialization of energy efficient and safer technologies. He has pioneered the establishment of multi-disciplinary teams for large externally funded research programs with participants and support from universities and their consortia, large corporations such a nuclear vendors, utility companies, small businesses, regulatory agencies and state and federal agencies. He received his doctorate in nuclear engineering from Stanford University in 1974. Ahmed Ibrahim joined the Department of Civil and Environmental Engineering (CEE) as an assistant professor in fall 2015 after more than 15 years in industry and academia. He received his doctorate in civil engineering from the University of Missouri. His research expertise is in concrete durability and experimental testing and numerical analysis of structural concrete elements. His research has been funded from Idaho Transportation department, the US DOT and from the industry. He has published more than 60 peer-reviewed journal articles and conference proceedings. Since coming to the University of Idaho, he has developed three new courses, which have attracted practicing engineers and graduate students from other universities. Ibrahim is involved in many service activities at the department and college levels; he currently serves on the CEE Curriculum Committee and chairs the CEE Infrastructure Committee. He is very active in the professional community at the national level where he chairs the Bridge Design Committee of the American Concrete Institute and is a voting member on several committees for the Transportation Research Board and the American Society of Civil Engineers. He is the academic advisor for U of I’s student chapter of the National Society of Black Engineers and mentors the ASCE Steel Bridge team each year. Ibrahim is a registered professional engineer in Idaho and Michigan and is planning to take the structural engineering exam. Assistant to the Director of Center for Secure and Dependable Systems (CSDS) Arvilla Daffin is deeply honored to receive this award. She feels this award could not be possible without the continued support of the students and faculty of CSDS. Born in Coeur d’Alene, Idaho, her family moved to western Montana when she was young. The family still owns the family farm where she raised several animals, learned to sew, play the piano and became a leader in 4-H and Grange®. After serving time in the US Navy, she moved back to the Coeur d’Alene area where she eventually starting working for the State of Idaho Department of Lands. 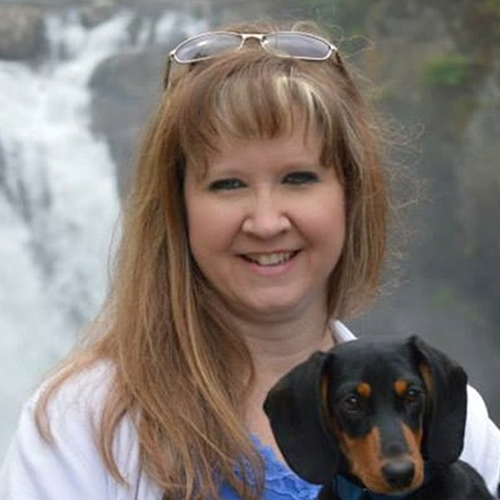 While at the Department of Lands, she worked in Fire Management and became the Coeur d’Alene office manager. Wanting a change of pace, she moved to Moscow and began working at U of I in January 2010. As the assistant to the director, whether it is managing the projects, the finances or proposals, or providing support with grants, Daffin is passionate about all aspects of her job. CyberCorps® Scholarship for Service is one of the projects where she works with cybersecurity students, honing in and fine tuning their soft skills which they use to obtain jobs with the government. The Cyber Defense Team is a recent addition where she helps the team with logistics and organization. Over the last three years, she started working with students in Electrical and Computer Engineering Department on power systems projects with students and faculty. Over the years, Daffin has spread the word about cybersecurity and helped CSDS grow in research and student involvement. She strives to make the status quo yesterday’s best. Daffin’s talented husband is the online psychology director at Washington State University. Together they have three boys, Patrick, Timothy and Alec. In her spare time, Daffin plays the piano at St. Augustine’s parish, she also enjoys spending time with her friends and family, photography, quilting, sewing, crocheting, cooking, gardening, wood working, yard work and in the spring time watching WSU baseball team home games. John R. Brabb (JR) was born in Pullman, Wash., and raised in Colfax, Wash.. Brabb grew up helping out on his family’s farm just outside of Potlatch, Idaho, which is owned and operated by several generations of University of Idaho Alumni. His first job was working for a genetics lab at Washington State University while he was still in high school. While there, he helped as a lab technician to create a gluten-free wheat. Then about a year later, he started working in the information technology field for WSU's Department of Crop and Soil Sciences . He graduated from Pullman High School and then graduated ITT Technical Institute with an associate's in network systems administration. 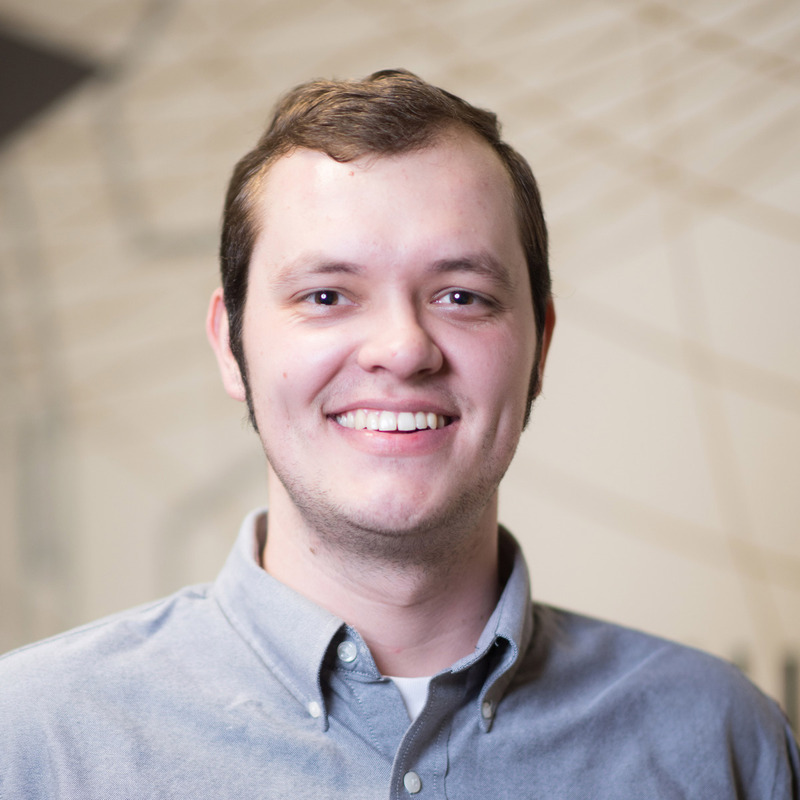 Just before graduation, Brabb was hired as an IT Specialist 1 with WSU's Office of Research. Later, he joined and became an essential part of the U of I College of Engineering IT team as an IT Analyst. Brabb directly supports and is supported by six departments: Biological Engineering, Civil and Environmental Engineering, Chemical and Materials Engineering, the Center for dependable Systems, Idaho Space Grant Consortium and the National Institute of Advanced Transportation Technologies; he enjoys working with multiple groups and appreciates all of them. Brabb is amazed by the great work environment at the U of I and also appreciates the wonderful people he gets to work with. Outside of work, he rides motorcycles with his father out on the road and on the family farm. He also helps his grandmothers whenever they need anything. He has also been known to stay up all night when his sister and brothers come to town. His passion is to build custom gaming computers and other gadgets with Red, Green and Blue (RGB) LED’s whenever given a chance. He is into pretty much anything that is technology-related.